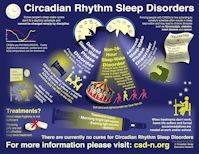 We're in the business of raising awareness about Circadian Rhythm Sleep Disorders, so we're eager to help reporters and others who are writing about these disorders and/or our organization. We are a non-profit corporation registered in the state of Maryland. We are recognized as a 501(c)(3) public charity by the U.S. Internal Revenue Service, so membership dues and contributions to us are tax-deductible in the U.S.
Our brochure summarizes the disorders we struggle with. The most basic information is in our Basic Fact Sheet. Some of the most frequently asked questions are answered in our Q&A docs, DSPS Q&A and Non-24 Q&A. 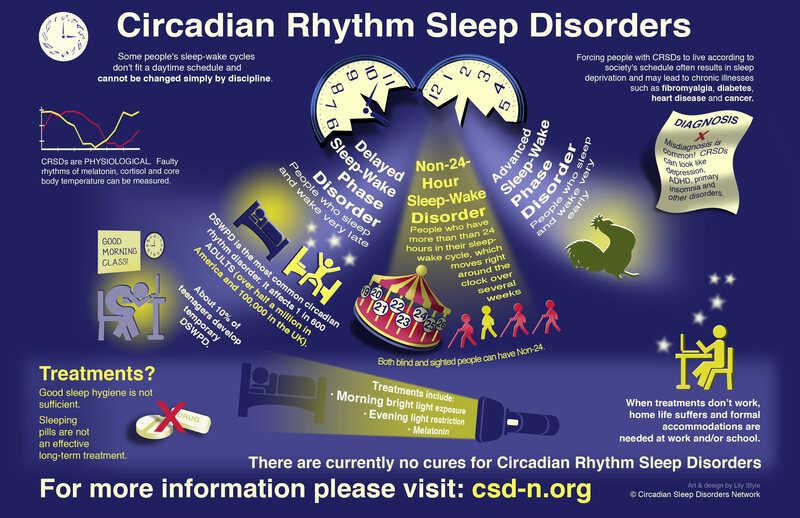 Our website, www.CircadianSleepDisorders.org, has lots more intormation about Circadian Rhythm Sleep Disorders. 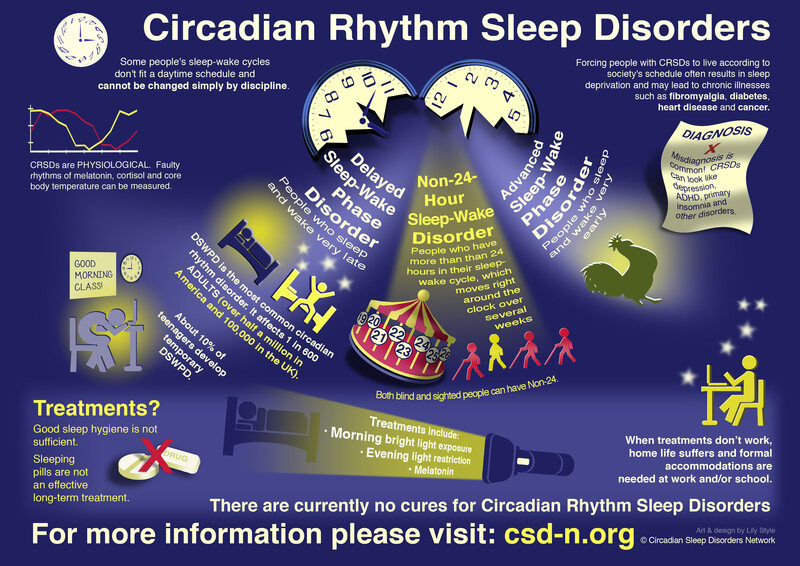 Our infographic briefly describes Circadian Rhythm Sleep Disorders (CRSDs). These are also collected into a playlist. Studies suggest that 1 in 600 adults suffers from Delayed Sleep Phase Disorder1. That's half a million American adults! In addition, it's been estimated that as many as 10% of teens are affected2, another two million American teens. Most of the teens will grow out of it. It is estimated that half of all totally blind people suffer from Non-24-Hour Sleep-Wake Disorder3: another 90,000 Americans. Non-24 also occurs in sighted individuals4, but the prevalence is unknown, and the disorder is almost certainly underdiagnosed. , or other members of our Board of Directors for further information or to schedule an interview. These are our trademarks. 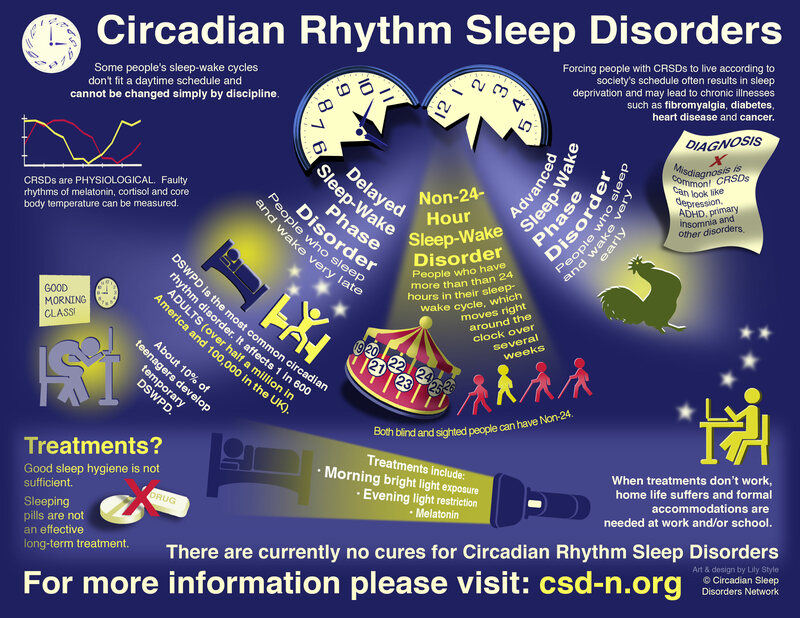 Please use them only in connection with Circadian Sleep Disorders Network. Click here for a very large logo, for resizing to your needs (appears on a separate page).